Make the tastiest stock from stuff you would normally throw in the trash! Recently I started watching the show ‘Scraps’ in which chef Joel Gamoran makes tasty dishes from ingredients that would usually end up in the trash. I really love the idea and now spend more time thinking how to use and re-use ingredients and trimmings. One of the dishes mentioned on the show was pesto made from carrot tops – that green stuff at the top. It actually tasted really good and I’ll definitely make that again. The video mentions potato skins as re-usable scrap. I would imagine that this can result in a bitter taste and you end up with a lot of dirt in your stock if you did not wash your potatoes. So what scraps did I rescue for my first stock? 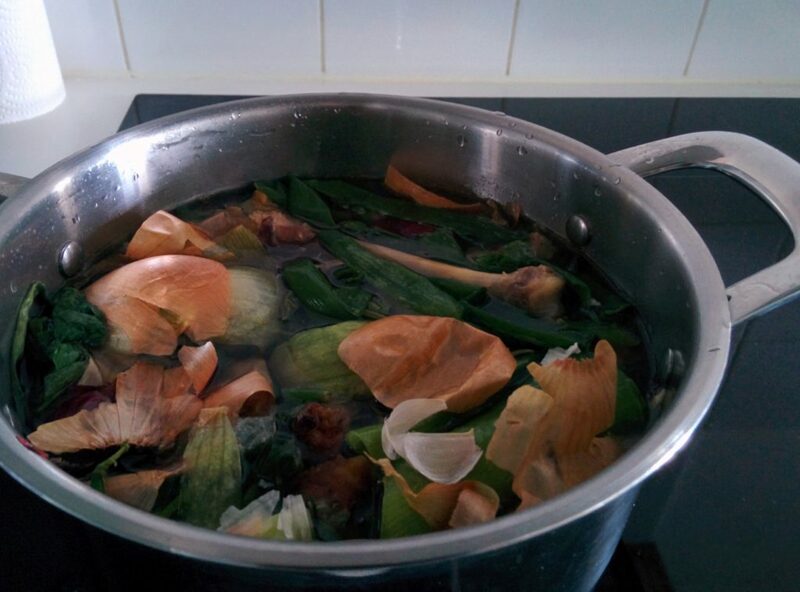 The stock had a really dark and rich brown color, which is probably primarily caused by the onion skins. So if you would like a lighter stock, you might want to skip these. Then I also used bones from chicken wings and lamb cutlets – yes, the bones that remained on the plate after dinner. I can understand why people would want to toss these, but I thought if I give this scrap stock a try I might go all the way. 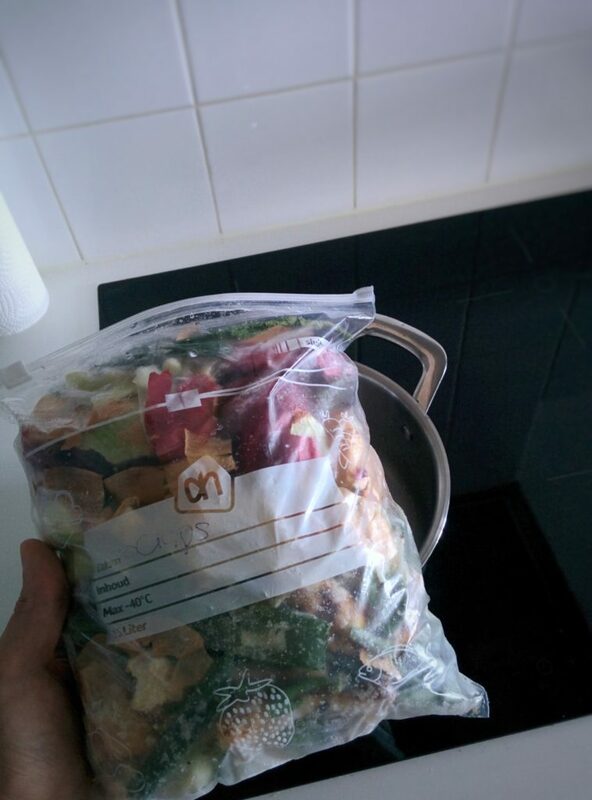 From a food sanitary standpoint, you cook the stock for an hour which would kill bacteria anyway. So you can see these as ‘optional’. So how did it taste? The stock has quite a mellow but rich and complex taste. You can taste that it’s extracted and concentrated flavor from all kinds of different vegetables. 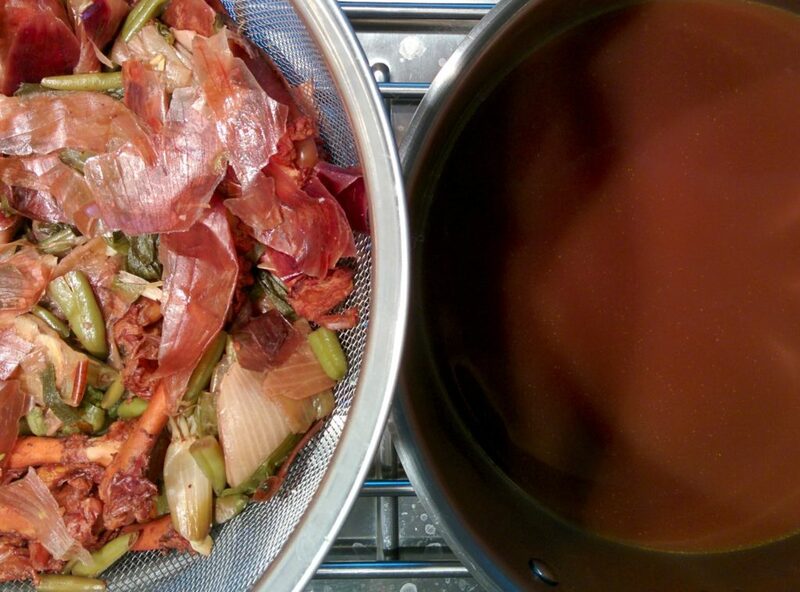 If you have every made vegetable stock from scratch, you’ll definitely see the resemblance. The bones gave a bit of fat and richness to the stock. Remember that I did not add any salt to the stock yet, so you are only left with the taste of your vegetables and bones. 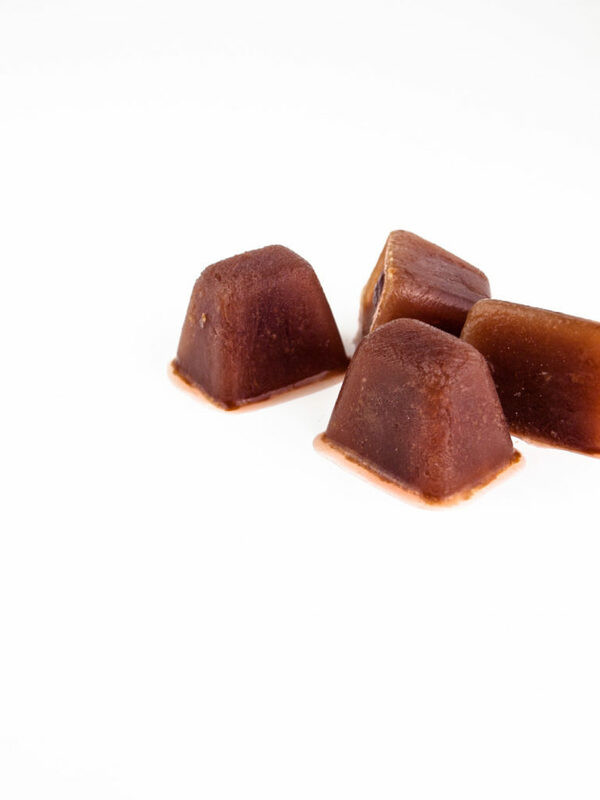 Frozen stock cubes made from scraps! Ready to end up in soups, gravy or wherever! To me this scrap stock was a full success! I’ll never just throw out my veggie trimmings again but save them in the freezer until further use. I was really surprised how quickly the freezer bag was filled and how much trimmings I throw away every week. It took only 2 weeks until I could not fit anything in there anymore. So get going and make your own scrap stock! Have you ever tried making stock from trimmings yourself? Let us know which scraps you used in the comments below!